Smart Dolphins has been working closely with Pearlman Lindholm for over a decade. The partnership has been incredibly beneficial for both parties. In this case study, we review the impact of a solid IT infrastructure on the productivity of a progressive, IT-dependent law firm. While there are still many “old school” law firms, technology is pervasive at Pearlman Lindholm. 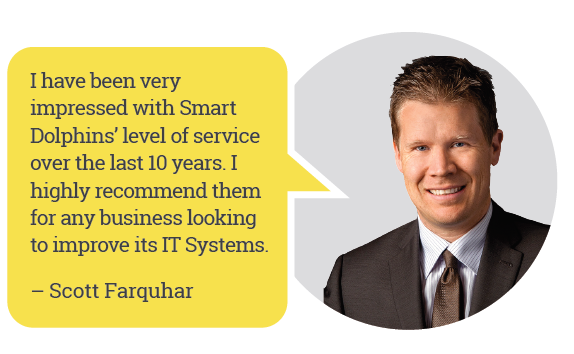 With over 16 busy lawyers and many more supporting staff, the diverse and progressive firm has many technology elements that Smart Dolphins has integrated and supported. Firm-wide downtime would be costly with over 40 people utilizing the network. Also, recurring small problems that cause even a small drag on productivity across the firm’s staff could come at a tremendous, insidious cost. The profitability of the firm and the firm’s high quality service rest on the quality of the IT infrastructure. The antithesis of productivity is problems. Smart Dolphins quantifies problems by tracking the number of problems per computer. This “Network Noise” is expensive to a progressive firm like Pearlman Lindholm. Each problem will be sapping potential billable work, not to mention the energy and momentum of the person affected. A single problem might appear to only steal 15-20 minutes and only take an hour to fix. But, if you consider the math across a sizeable organization, experiencing a lot of these kinds of problems on a recurring basis, this can be a major loss. We should also factor in the time leading to the resolution as well as the time spent coordinating the required IT Support work. In short, on a macro level, IT problems, large and small are more costly than they initially appear. 25 employees wasting just 10 minutes per day on minor IT issues is like hiring someone to do nothing for 6 months of the year. starts to decline within 3-6 months after we apply our proactive processes to the network. 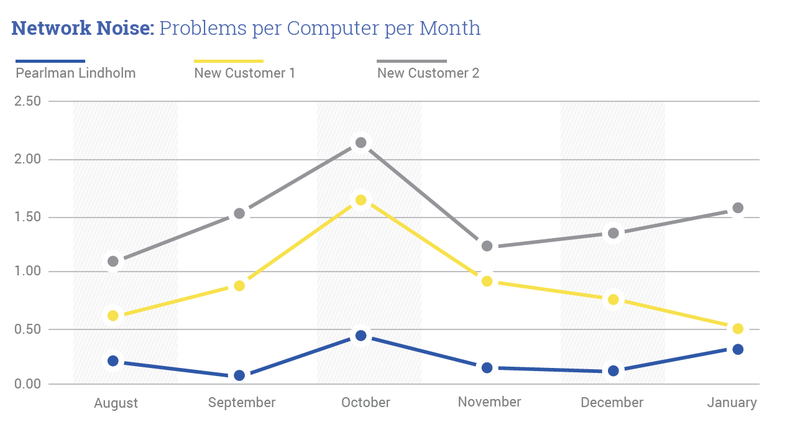 With enough time, the customer benefits from having their Network Noise decline to between 0.2 and 0.4 problems per computer per month. This is 20% of their initial “Noise”. In the following chart, we show six months of real world Network Noise of Pearlman Lindholm versus two of the newest Smart Dolphins customers that joined us afterwards. All three companies are similar in size and complexity. You can see the impact that applying years of Technology with Porpoise has had on Pearlman Lindholm. They have a quiet network in comparison to the two new customers that have just begun. How does Smart Dolphins provide such dramatic results? The key to success in IT support is not technology. Certainly having great people is important, but lots of IT companies have great people. The critical element for Smart Dolphins is our structured, methodical, proactive approach. It’s our “Process”. It is HOW we do what we do. Our Process is too detailed to review in this brief Case Study. However, this would be perfect for an in-person discussion for those interested in learning more. Please contact Smart Dolphins so we can discuss how we provide Technology with Porpoise.